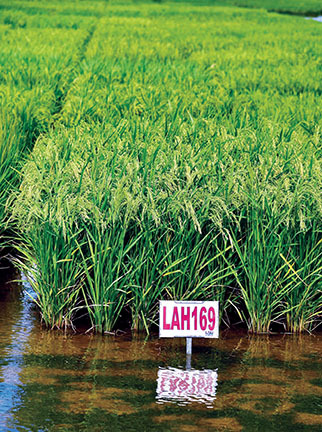 LEFT: The hybrid LAH169 has been developed with an emphasis on quality, with good disease resistance and yields exceeding 9,000 pounds per acre in Louisiana trials. Bids are expected to be solicited this spring with the anticipated production of more parental seed in Puerto Rico. RIGHT: Adam Famoso, LSU AgCenter rice breeder, evaluates lines of rice in small plots at the H. Rouse Caffey Rice Research Station. In addition to developing new varieties of Provisia and Clearfield, Famoso is also working to develop conventional varieties. 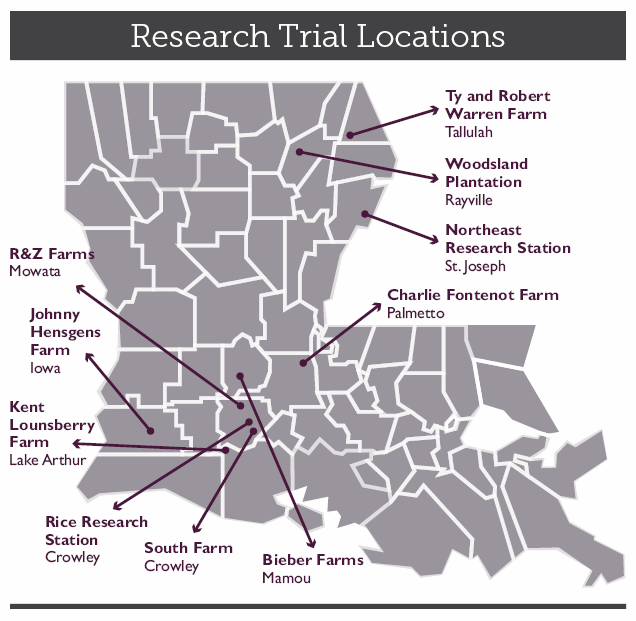 Breeders at the LSU AgCenter H. Rouse Caffey Rice Research Station work continuously to develop new varieties and hybrids. A significant portion of the research station’s mission is to provide farmers with more improved options to consider at planting time. 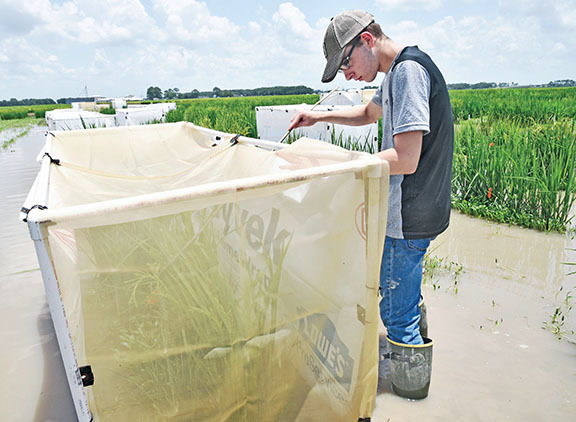 The hybrid line LAH169 continues to perform well in uniform regional nursery trials in the five southern rice growing states, said Jim Oard, LSU AgCenter hybrid breeder. In Louisiana, the 2018 yield exceeded 9,000 pounds per acre, but in Arkansas the yield was more than 11,000 pounds. Oard said this hybrid has good grain quality with low chalk. Because it is early maturing, it will have good ratoon potential, he said. It has good disease resistance, making it attractive to farmers who grow row rice, he said. Hurricane Maria caused a delay in the 2018 planting of the parents of LAH169, which resulted in an insufficient amount of seed to bring this hybrid to the marketplace. Rogers Leonard, LSU AgCenter associate vice president, said bids for LAH169 will be solicited this spring after more parental seed is obtained from Puerto Rico, which is expected in March. Work continues on additional hybrid lines. Oard said four new candidate hybrids showed good results in 2018, with competitive yields and good lodging resistance. “The goal is to move them along as quickly as possible,” he said. Oard said he is also working on developing sheath blight-resistant lines of nonhybrid rice, and five lines will be advanced in 2019 for a preliminary yield trial by LSU AgCenter rice breeder Adam Famoso. be available for a limited commercial release in 2020. In past years, PVL108 out-yielded PVL01 by 10 percent, according to Famoso. However, this year’s yield from PVL108 was the same as PVL01, as PVL01 demonstrated improved yields in 2018 over the previous years. Across five locations and 10 trials in 2018, the average yield of PVL108 was 7,960 pounds per acre (49 bbls) compared to PVL01 at 7,604 pounds per acre (47 bbls), Famoso said. This is compared to 8,100 and 8,320 pounds per acre for Cheniere and CL153, respectively, in the same trials. “Additionally, PVL108 has consistently demonstrated an improved ratoon yield over the last three years, with an average ratoon yield advantage of 20 percent over PVL01,” Famoso said. The quality of Provisia is excellent, he said. Famoso said two conventional lines that out-yielded varieties such as CL153, CL111 and Cheniere and produced more than 9,000 pounds per acre will undergo continued statewide testing and initial seed purification in 2019. One of the lines is a cross between Cheniere and Mermentau. “If they continue to perform as well, it’s very likely they will be candidates for release,” he said. Two Clearfield long-grain lines were tested for a third year in 2018. Both have good blast resistance, and one could be a candidate for limited release in 2020. The breeding program has improved its efficiency. In 2018, 42,000 progeny rows were planted, about 40 percent fewer than in previous years, Famoso said. “We’re reallocating some resources to have more early generation selection at the F2 stage with markers and more yield test plots in multilocation testing,” he said. Along with the testing plots at the Rice Research Station, yield testing is conducted at eight locations across the state. 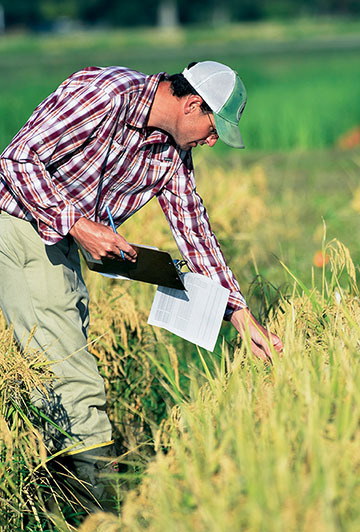 Advanced yield testing is typically conducted with 60 lines tested at eight locations each year. In 2018, an additional test, the regional yield test, was added. It includes 150 entries tested across five locations in Louisiana. “This is a significant increase in the amount of materials tested in multi-location testing, but multilocation testing is critical to getting a good understanding of an experimental line’s potential, and the more lines we test, the more likely we are to find a winner,” Famoso said.